1 x Bridal Austrian Crystal Tiara. Tiara Height(Max): Approx 5cm. Suitable for any wedding part, evening part or other occasions. New and high quality. Color: Silver. Buy It Now. WHITE FLOWER HEADPIECE W/ RHINESTONE AND BOW FOR COMMUNION, FLOWER GIRL, WEDDING~~~. Head piece is decorated with rhinestones. The flower band is around 1" wide. Tiara Height: About 2.0" (5cm). Material: Silver Plated Alloy & Rhinestone. Color may slightly vary due to different device resolutions. Give us a chance to make things right for you, and we will do our best to give you the best possible solution. Size: App 13.5 6cm (D H). 1 x Ruby Red Crystal Gold Crown. Type: Red Crystal Crown. Gold plated and Red crystal materials can make you shine in the crowd. Material: Czech Crystal Gold Plated. Color: Gold&Red. Our delicate flower girl halo wreath can be used for flower girls, bridesmaid, a girl's First Communion, spring shooting and many more. White Acrylic Flower Girl Halo Wreath Crown. - high-quality clear acrylic flowers with stunning pearl and rhinestone accents. Give us a chance to make things right for you, and we will do our best to give you the best possible solution. It depends on your location. Canada and International Countries. Simply stunning! You are looking at gorgeous Queen floral tiara crown. All rhinestones sparkle a lot! 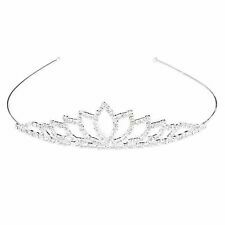 This tiara is perfect for wedding, prom, party or any special occasions. Center section is approx. Tiara: No comb; use bobby pins to secure it in your head. Mild dish soap and water. In a small bowl mix soap and warm water. With a soft bristle tooth brush, scrub the jewelry with the soap/water mixture. This tiara will look great on your little girls! 1 x Rhinestone Tiara. The crown area is located at the top of the headband and is very easy to wear without the help of pins. Product Type: Hair Accessories. Give us a chance to make things right for you, and we will do our best to give you the best possible solution. Part of Ukraine It depends on your location. Canada and International Countries. Type: tiara crown Stone / Color: Austrian crystal / clear Metal: silver plated alloy Dimensions: 2.375" * 7.75" Quantity: 1 pc Photo is not to scale. Please refer to dimensions listed above. We have tried to keep the images as accurate as possible, however there might be some color variations in the images published on our store and the real product due to light effects and photography or brightness of your monitor and light. Thank you for understanding. Brand Irises Land Metal Silver Plated Color Clear Material Rhinestone Main Stone Crystal Style Hair Claw UPC Does not apply UPC Does not apply. Descriptions: Material: Alloy Gender: Men's Color: Gold Diameter: App 18cm = 6.6 inches(Approx.) Tiara Height: App 5.5cm =2.1inches(Approx.) Perimeter: App 51cm =20 inches(Approx.) Weight: App 165g Measurement Details in the attached picture Note: 1.The real color of the item may be slightly different from the pictures because of monitor and light brightness. 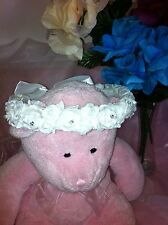 2.Please allow slight deviation for the measurement data..
Our delicate flower girl halo wreath can be used for flower girls, bridesmaid, a girl's First Communion, spring shooting and many more. White Flower Girl Halo Wreath Crown. One size fits most girls. Tiara Crown. Type: tiara crown. Stone / Color: Austrian crystal / Clear. Antique Rhinestone Earrings. Rhinestone Earrings. Rhinestone Bracelet. 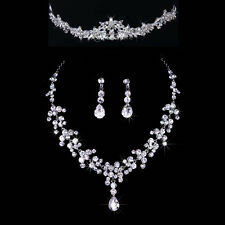 Rhinestone Set. Wedding Hair Jewelry. Typically we have one hit wonders and the product listed is the actual product you will receive. By purchasing an item from us, you are agreeing to the information provided below. Our beautiful full circle tiara features sparkling large clear crystal rhinestones and elegant pearls on gold plated setting. This gorgeous tiara can be perfectly paired to any bridal dress, formal wear, Quinceanera dress or pageant outfits. 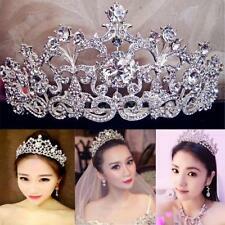 SILVER WITH AB IRIDESCENT RHINESTONE CRYSTAL BEAUTY QUEEN LARGE TIARA CROWN BRIDAL PROM PAGEANT. The unique design with AB Rhinestone crystal lovely piece. Ideal for brides, bridesmaids, pageant contestants, wedding, party, prom or any special occasions! 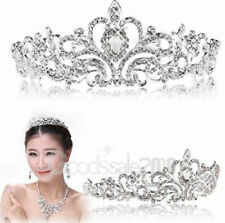 SILVER WITH AB IRIDESCENT & CLEAR RHINESTONE CRYSTAL BEAUTY QUEEN TIARA CROWN BRIDAL PROM PAGEANT. The unique design with that clear& AB Rhinestone crystal lovely piece. Ideal for brides, bridesmaids, pageant contestants, wedding, party, prom or any special occasions! Simply stunning! You are looking at gorgeous heart and floral tiara crown. All rhinestones sparkle a lot! 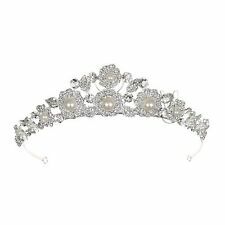 This tiara is perfect for wedding, prom, party or any special occasions. Center section is approx. Color: blue glass of rice white pearl. Give us a chance to make things right for you, and we will do our best to give you the best possible solution. It depends on your location. Canada and International Countries. Color: Retro. The real color may be slightly different from the photo, due to a variety of factors such as computer screen contrast or light. Material: Glass. problems for you. We would be always here to solve all the. Simply stunning! You are looking at twinkling tiara crown. All rhinestones shines a lot! This tiara is perfect for prom, party or any special occasions. Center section is approx. Tiara is approx. 16cm-18cm/6.3"-7". 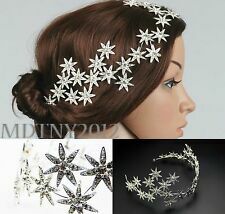 Floral Headband with simply, sweet, romantic, elegant design, makes you look more charming and eye-catching. This flower crowns aren't just for fairies, princesses, or little girls. 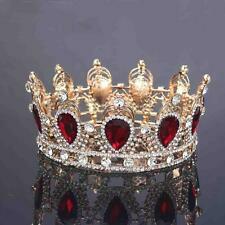 This charm shining rhinestone design Tiara ,makes you like a prince. Tiara Height: App 5.5 cm =2. caused by many factors such as brightness of your monitor and light brightness. Color: Silver,Gold. Type: Bridal Crown. 1 Bridal Crown. There are small inside small circle, you can use the hairpin through the circle to the crown. Material: Alloy,Crystal Rhinestone. The real color of the item may be slightly different from the pictures shown on website caused. Black crown is special and full of baroque style. Type: Baroque. 1 x Baroque Crown. Material: Alloy,Rhinestone. 1 pc of crown only,other accessories demo in the picture are not included! Ideal for wedding or photography. Type: Baroque Queen Crown. 1 x Baroque Queen Crown. Glitter, elegant, beautiful,suit for party or wedding. Height: App 5cm. Material :Alloy Red Crystal Rhinestones. (Not including the other decoration.). 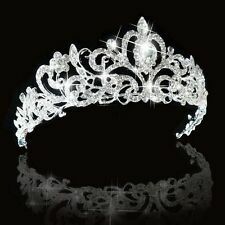 You will be receiving 1 beautiful small silver plated rhinestone comb in tiaras as shown in the picture. Great for party favors too! Bride Tiaras are a fine way to look your absolute best thanks to sharp formal attire. Choose the correct color and size from the different listings to fit your needs. Look for colors like silver as well as others. Take a look at a variety of styles including headband. Bride Tiaras are available in new or pre-owned condition on eBay, so you can cut your cost further.